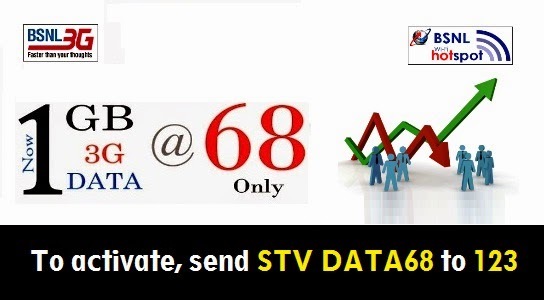 State run telecom operator Bharat Sanchar Nigam Limited (BSNL) has decided to make it's most attractive Data Offer - DATA STV 68 - as a regular offer from 1st June 2015 onwards across all telecom circles in India. BSNL has also decided to reduce the validity of DATA STV 68 from the existing 10 days to 7 days. In addition, BSNL has also decided to revise almost all of it's prepaid 3G/2G data STVs from 01-06-2015. Existing Data STV 176 which offers 1 GB free data will not be available from 1st June onwards. A new data stv 198, offers 1.1 GB data will be available instead. Existing Data STV 451 offers 2GB data, will offer 2.2 GB data + Rs 100 as Talk Time with a validity of 60 days. BSNL has decided to reduce the validity of other Data STVs also. The validity of Data STV 98 will be reduced from 17 days to 16 days. The validity of 1 GB data pack 139 will be reduced from 19 to 15 days. Data STV 155 will now offer 22 days validity instead of 26 days. The above revision in prepaid 3G/2G data stvs will be available from 01-06-2015 across all telecom circles in India. Dear readers, please share your views and opinions about these latest tariff revision by BSNL via comments with us. Increasing the cost and reducing validity period is not a good news for user. Now we are facing speed issues. Also there no back up in many of towers. Whenever the supply fails we are disconnecting. I am living at kuzhuppilly (ernakulam dist) and the tower is about 250m from my home. Still I am not getting speed. Earlier there was no such issues. Even after paying the high price if we are not getting good service we will be forced to migrate. Thanks for the update. So it is not price hike. It is due to increase in service tax form 12.36% to 14%. i recharged for the annual data plan 1251 for 9 GB on May 25 2015 with bsnl portal to avoid monthly recharging. Now i see no such plans on the website. and also my account on dialling 8124*2# shows it asPlan freebies 1251; expiry date 27/6/2015; 2KB left out of plan 1251 Freebies.. what is the fate of my recharge? i am at calicut. I took a bsnl connection only for data. Now that has become almost useless. More than the cost itself, the validity is important and there are no plans in bsnl that is valid for a whole month (30 days). A 500/600MB valid for a month as well as 1GB valid for a month are very useful plans at reasonable cost and hopefully something of that kind would get introduced soon. Migration is no solution , all networks have same speed issues . Actually i feel low speed have less to do with technical and more to do with marketing policies of service providers.